The economic costs of heat stress will vary depending on geographic location and facilities. For California cows with access to shade but not fans or sprinklers, losses are estimated to average $110/cow/year. Losses are higher in cows without access to shade. Cows are more sensitive to heat stress then humans, with production losses starting in the mid 70 degrees in moderate humidity and in the low 80’s in low humidly. Providing adequate shade may be the most cost-effective heat-stress mitigation available. Addition of sprinklers/soakers or misters/foggers can leverage heat stress reduction provided by shades. Optimal practices will differ from farm to farm, but the majority of western dairies should consider cooling the holding pen and exit lane sprinklers. For severe heat stress events, the easiest way to tell if cows require emergency cooling is by counting respirations. If more than 5 out of 10 cows (50%) have breathing rates exceeding 100 breaths per minute, immediate action should be taken to reduce heat stress. Heat stress will of course vary depending on a farm’s geographic location and facilities. One study estimates that California dairies with minimal heat stress abatement (access to shade, but no fans or sprinklers) lose $110 per cow per year. 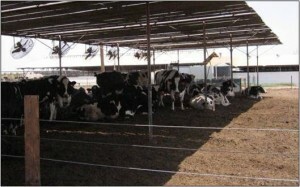 Losses are higher in cows without access to shade. Decreased milk production results in large part (but not exclusively) from reduction in Dry Matter Intake (DMI). California dairies with minimal heat stress abatement are estimated to experience average DMI reductions of 320 lb/cow/year, and a concurrent decrease in milk production of about 650 lb/cow/year. Embryos are also susceptible to increased body temperature resulting from heat stress. Reproduction can suffer even more than milk production with Florida data estimating up to a 53% reduction in conception rates during the summer and into the fall. California operations with minimal heat abatement are estimated to experience in average increase of 12 days open and almost a 1% increase in reproductive culling. Production losses are not limited just to lactating cows. Heat-stressed dairy cows have been observed to produce 1,000 to 2,000 pounds less milk during the next lactation. 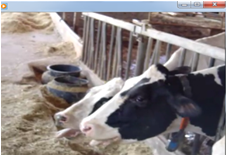 When does heat stress start in dairy cows? Heat stress results from a combination of factors including ambient heat & humidity, local air movement and absorption of radiant (sunlight) energy. Cattle are actually more sensitive to heat and humidity then humans. The best way to anticipate whether environmental conditions will have a negative effect on production is to examine a dairy-specific Temperature Humidity Index (THI) chart. Mild heat stress starts to occur at a THI value of about 72, which corresponds to 77°F and a typical Tulare morning humidity of 50%, or at 82°F at a typical Tulare afternoon humidity of 20%. Even at THI values in this “mild” category, reproductive losses have been documented and milk production can be decreased by approximately 6 lbs/cow/day. Recent studies in high-producing cows suggest that smaller detrimental effects can be at THI values as low as 68. Inexpensive thermometer/hygrometer can be purchased to determine THI values at different locations on the dairy. How can I tell when my cows are heat stressed? Certainly cows that are panting with open mouths are in severe heat stress, but at low to moderate levels producers may not observe obvious signs. As described in a review from the University of California, cows do consistently exhibit certain behaviors when trying to mitigate heat. With rising air temperature and solar radiation cows will increasingly seek shade. Even cows that have deprived of lying for 12 hours will prefer to stand in the shade rather than lie in the sun, sometimes even engaging in aggressive behavior to gain access to it. Either in or out of shade cows will spend as much as 10% more time standing, possibly to increase air flow around their bodies. Cows will reduce their feed intake, in one study up 5% per day in at 90°F. In a Florida study cows without access to shade ate 19% more at night, but were not able to make up of the decreased feed intake, still eating 13% less then cows with shade. Unshaded cows may also spend 2 to 3 times more time standing around the water trough. The most sensitive and practical measurement of heat stress is respiration rate, which unlike rectal temperature, increases in response to heat load with little or no lag in time. Normal respiration rates for cattle are about less than 40 breaths per minute. If five cows out of 10 have respiratory rates exceeding 100 breaths per minute immediate action is indicated. 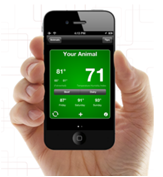 The University of Missouri has released a smart phone app that allows beef and dairy producers to merge their cows’ breathing rates with local heat and humidity data to instantly determine heat stress rating and recommendations. General – During times of high heat stress cattle should only be worked during the cool of the morning and vaccination should be avoided. Water intake may double during times of heat stress and water should always be available free choice. Cows consume 50-60% of their total daily water intake immediately after milking so making water troughs easily available after exiting the parlor is useful. Waters should be shaded to encourage consumption. Feed – There has been considerable investigation into ration formulation to mitigate DMI reductions. Feeding strategies to mitigate heat stress on California operations has been reviewed and typically involve increasing dietary energy density through increased grain or fat. Increased rumen buffering may be necessary to prevent acidosis associated with reduced forage intake and increased high-energy feed intake. Changes in the ration should be made slowly and prior to the onset of hot weather to reduce throwing the cows off feed. Ultimately manipulation of the cows’ diet will result in minimal improvement in production when compared to modifying the cows’ environment. Shades – It is estimated that heat load can be reduced from 30 to 50% with well-designed shade, increasing production by 10%. Cows will preferentially seek out shades blocking at least 50% of solar radiation. Shade cloth properly maintained (kept tight) can last for 5 years or longer. A north-south orientation allows the sun to dry the ground under the shade, which should be groomed regularly. Guidelines regarding sizing of shades vary but typically call for at least 40 to 50 square feet per cow. Eave heights of at least 12 to 14 feet are needed to minimize thermal radiation from the roof. Use of Fans and Sprinklers/Soakers and Misters/Foggers – Sprinklers or soakers use large water droplets to wet the cow. Adding sprinklers to shade can double cow’s relief from heat stress. Fans can be used to further promote evaporation and cooling the cow’s hide, although fans alone may have little or no benefit. Unlike wetting the cow with sprinklers, misters or foggers are used to cool the local air through evaporation and may use less water. Shade and evaporative cooling has been used in a variety of locations on the farm including dry lots, free stalls, holding areas, exit lanes, feed lines and even with pastured cattle. A variety of equipment and farm locations for heat stress mitigation has been reviewed. One place where sprinklers and fans are particularly useful is the wash/holding pen where cows experience the greatest heat stress on the dairy. Optimal practices will differ from farm to farm, but the majority of western dairies should consider holding pen cooling and exit lane sprinklers under shade. Other Mitigation Methods – Strategies used to mitigate reproductive losses associated with heat stress have been reviewed. Timed or delayed insemination can lessen the effect of reduced exhibition of estrus and reduced bull fertility associated with heat stress. During heat stress embryo transfer may have double the conception rates compared to artificial insemination, although using ET in all cows may not be economical. Return on investment in cooling equipment? Return on investment is challenging to estimate because of variability in milk price, power costs, existing infrastructure but primarily how many days a year the cooling equipment would be used. Dairies in Florida might use fans and sprinklers for 7 months while those in Kentucky might use them for only three months. Following installation of fans and sprinklers studies in different states, studies have variously reported increased milk production of between 5 and 19% during heat stress months and suggested that the investment could pay for itself in 2 to 4 years. Producers considering installation are advised to review their local climatic data and construction options with a farm engineer and extension specialist. The University of Arkansas advises that if more than five cows out of 10 have respiratory rates exceeding 100 breaths per minute, then immediate action should be taken to reduce heat stress. The best tools available to livestock producers dealing with heat stress are adequate and accessible drinking water, shade and water-cooling. Dairy producers should be sure that they can milk, water and cool their cows, even in the event of rolling blackouts or power failure. Many producers have back-up generators for their milking parlor, which should be inspected to ensure operational condition. Emergency power should also be available for fans and well pumps. Misters, soakers and fans should be checked to ensure they are operational. Shade structures (especially shade cloths) should be in good repair. Fire hoses can be connected to water trucks and used to soak the cattle. Use caution with this method since cattle unused to this treatment may run away from water causing injury. Temporary soaking lines can be devised using flexible landscaping hose and high volume emitters positioned over the cattle. Industrial fans have been rented to augment these water-cooling methods. Temporary shade structures have been erected. When wetting the animals use large droplets (150 micron diameter sprinklers) not a fine mist, and wet the animals to the hide to saturate the hair for maximum cooling effect. The water should run off the animals. In general, working cattle should be avoided except in the early morning.